The following is personal opinion and speculation only. But my first reaction to the departure of Philip Rosedale (a.k.a. Philip Linden) from the CEO role at Linden Lab was “ah, suddenly all the rest starts to make sense.” It explains the abrupt Philip 2.0 contest termination after 2 months of silence, it ties in with the Linden departures of Marty (legal) and Catherine (marketing), the closures of the international offices, the (at least perceived) tanking of their corporate value, one has to wonder exactly is going on at Linden Lab. It’s true that Philip Rosedale’s return was always billed as an interim position, but it seems it was always promoted as part of the plan to guide the long-term development strategies, and internal and external culture, back “on track”. To restore the original vision, in a new way updated for the changing times. In the hundred or so days while Philip Linden 2.0 was CEO (the second time), it seems the most notable change is his avatar. Of course, behind the scenes he worked with Bob Komin (CFO) to guide him in his new role as COO, but after the 3+ months of Philip 2.0, we now have a new acting CEO as well. Actually not a new CEO, the same Bob Komin in the new role of CEO. Along with COO and CFO. There are 23 more middle letters for Bob to add so there’s lots of room for growth there. What concerns me about this is that Philip is leaving before a new CEO has been selected. And, adding CEO to the burden carried by Bob Komin. Almost as if there is a rush to get out… now. There is also the possibility that he simply cares more about, or feels there is a more urgent need at, his position at Love Machine. I’ve been a professional software developer since 1984. The companies I have worked for have been swallowed up when least expected, slid into a grave when least expected, gutted the entire executive management when least expected, announced layoffs when least expected, etc. I’ve seen just about everything in those 26+ years. This smells. There is big news coming. I don’t know what it is yet, but it’s coming. My spidey sense has been tingling for some time now, and every week it seems more fuel is added to that fire. I think this confirms that the acquisition speculation is off-base, or whatever interest there was in acquiring LL has now died. Instead, I feel that what we have here is a product entering “maintenance mode”. This is further promoted by the departure of Catherine Smith, Marketing Director, not to mention the closure of the international offices, and the 33% (and growing) layoffs. My history tells me that the major R&D investment is now over. Totally over. Instead, now begins the process of maintaining the product, just enough to try to preserve the existing customer base. To milk the product for as long as it can draw revenue. They don’t need expensive legal counsel now: exit Marty. They don’t need a go-get-em Marketing Director: exit Catherine. They don’t need a wealthy innovative thinker who could do anything, including sit around at home or go camping, but loves to start those new projects “for fun”: exit Philip 2.0. Heck, they don’t need many of the forward-thinkers and innovators: exit Pathfinder, Babbage, even Qarl. They just don’t need people like Cyn and Pink and Alexa and Soft Linden, and so many others in The New Virtual World Order. What they need is someone who can guide the financial numbers and continue to provide some form of ROI for investors, and to maximize what remains. They need a CFO, in charge of the boring day-to-day, from a financial perspective. Oh look, first Bob Komin is made COO… and now BK is acting CEO. Thus begins the milking. But I doubt that is where BK wants to be. So stay tuned for more news to come. The flaw in this theory is that strangely Mark Kingdon (a.k.a. M. Linden) may still belong there, if this article is accurate. However, my theory is that maybe they didn’t know that in June. I get the distinct impression that something changed; that Linden Lab received some bad news that changed their plans. Perhaps the “plan” for Farmville 3D turned sour and Philip and the others have had enough. Perhaps the planned purchase by Microsoft fell through, when the offer came in too low and didn’t climb. Or perhaps it was AOL who they expected to draw attention from and did not. Supposedly they are looking for another new CEO, and I believe that is accurate. I assume Bob is capable, but they would probably be better off bringing in a corporate “wind-down” specialist. A software farmer who knows how to milk the cow, while reducing feed costs. And I suspect that Bob is better suited growing a new startup, rather than slowing and milking a former software leader. There’s a lot of speculation in this article, but I fully believe that neither Philip or Bob want to preside over the demise of Second Life. Bob Komin will leave Linden Lab, and move on to a new-ish smaller company with significant growth potential. In other words, Bob is at the wrong end of the corporate cycle, so he won’t be in that position once they find someone interested in taking the reins. Also, the rats are fleeing the sinking ship. The executive management list is getting shorter and shorter. There will be more bailing. This could be described as old news, but I haven’t really seen anyone pull it all conveniently together, and I wanted to post this with some commentary as a follow up to my What Is The Linden Master Plan? blog posting earlier. Some time ago, I spotted an update from wizardgynoid on Twitter that the SharesPost perceived value for Linden Labs had dropped about 30% in 5 months, from $383 million in March, to $271 million in August. 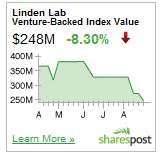 This month, they now value Linden Lab at $248 million. That is a drop of just over 35% in the last 6 months. I don’t know, but I would imagine that all of this may shed some light into the sudden return of Philip (Rosedale) Linden as CEO, perhaps back to protect his investment. 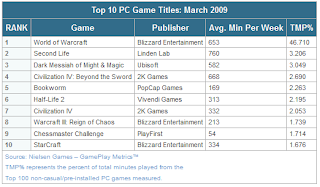 One year before that, Nielsen published some statistics for online PC games for March 2009 that showed Second Life as the number 1 game when sorted by the average number of minutes spent online in the game each week, with 760 minutes per week, on average. 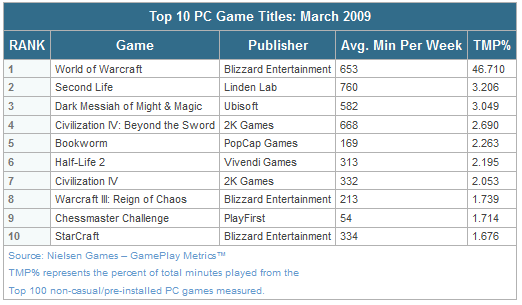 Blizzard’s World of Warcraft followed close behind, with an average of 653 minutes per week, although they were keeping separate statistics for World of Warcraft III: Reign of Chaos, which grabbed another 213 minutes per week. 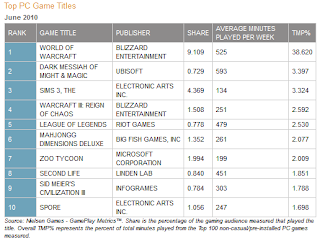 It should also be noted that Starcraft, another hit from Blizzard, grabbed another 334 minutes per week. However, the point I am making here is not one of comparisons to other online environments. The comparison is the timeline for Second Life alone. By June of this year, 15 months later, Second Life had dropped from an average of 760 minutes per week to 451 minutes per week. That’s down more than 40%. While there are many reasons that could be promoted for this decline, it follows a very long sample period, of 15 months. So it represents a trend, or at least a long-term decline, and one that Linden Labs must do something to correct, or the Second Life world will be in very, very big trouble. But what does a decline in average minutes per week really mean? the number of “lighthearted” or “volatile” part-time residents is increasing. Either way, community support for Second Life would seem to be getting “watered down”. If you thought, “meh, yawn”, then that’s another sign of the problem here. I believe that many of the long-term, most ardent supporters of Second Life have changed over the last 12-24 months, to a position of “interested observer”, taking more of an attitude of a “well let’s wait and see if Linden Lab can turn things around”. Many have chosen to also experiment with new homes on other virtual worlds, like InWorldz or Open Sim grids. Others have given up on Second Life entirely, or almost entirely, abandoning assets and investment in Second Life for whatever alternatives may be available. Sometimes for those new grids, sometimes just abandoning it entirely. Even the keenest supporters of Second Life are likely to be worried by the decline above, and the effects that loss of company value may be having on policies. Was the closing of the teen grid directly related to the loss of share value? The 30% layoffs? Did it lead directly to the return of Philip Rosedale to the CEO position? This blogger feels that there is one major thing leading to the decline of support, or interest, in Second Life: the perceived attitudes and business philosophies of Linden Lab. Residents need to perceive that there is a future there, and a future that still recalls the past, when Second Life was a land where a resident could make many of their dreams come true. An environment where they could do anything, be anything, build anything. Whatever they desired. A time of partying in packed clubs, a virtual career in modeling, fame and/or fortune in retail business, night after night of cybersex and debauchery, or success (or failure) in the virtual real estate market. But whatever the dream, the dream was that of the resident’s, and theirs to succeed in, or fail. I no longer believe that to be the case for Second Life. Now too much depends on the policies of Linden Lab. The was a time when there was a place in Second Life for a entrepreneurial startup, say, a struggling new Anshe Chung, to succeed beyond her wildest dreams in the area of virtual real estate investment. That possibility seems to be all but dead now, with the policy changes that pretty much insist that all significant profit from virtual land sales belongs to Linden Lab. The Lab has directly entered the market for rentals, using their position as platform supplier to compete against independent resident land owners, and has held the price of “mainland” land (which they are the sole estate owner) to be constant, even though much of the mainland has been abandoned by land owners. There is a huge surplus of land on the mainland, and yet Linden Lab cannot even bother to set the parcels for sale once again when someone returns land. Perhaps that is a failed attempt to try to hold the price of land artificially high, but clearly it is not working. It’s difficult to sell land even for L$1 per sqm. That figure used to be fairly stable at 6-7 L$/sqm, so the value of land has dropped about 80% in the last 2-3 years. In the meantime, Linden Lab has increased the cost of private estate homesteads, a key staple of independent landlords, by 66%. For anyone wishing to point out that private estate full regions have not increased in price, it should be noted that those regions were already 50% higher than mainland regions, which cannot be a privately owned estate. That might be survivable, but these changes were done in addition to changes to search, that leave in-world shopping in an almost incomprehensible state. Now, for your shop to show up in search, you have two choices: cheat the system, or bribe the system. You can pay (dearly) for your searches to appear at the top, or you can use bots and other false promotions to “game the system” such that it artificially inflates your search score. So now, if you managed to survive the huge and dramatic increase in costs, there’s fewer residents to actually find your land, your club, your retail store. Unless you cheat the system… or pay even more… again… to Linden Lab. I would love to see a virtual world where the only purpose for bots was for automating tasks, searching the grid for affordable land, building a list of parcels with certain keywords, etc. Not just for the sake of having them, to drive up traffic scores. Parcel traffic is a great statistic to have, but should not be applied when determining search results relevancy, i.e. the default presentation order of the search results. Neither should bribes payments by landowners. In a world where traffic and payments do have an effect on search, it renders the operation virtually meaningless. It forces retailers to look for an alternative to having an in-world store. Oh look… XStreetSL sales are up 224% in the last year. What a surprise! That must be good news! For someone, but not for Second Life businesses and residents. Not for in-world activity. But it’s not because of a viable online market. Linden Lab needs to remember what it was like… how pleasurable it was for the residents to be in-world… shopping… dancing… sending naughty IMs. It’s difficult to IM that person shopping on XStreetSL. Oh you still can, but not in Second Life. Once again, that’s something you would do… outside Second Life. Once again, Linden Lab decisions are discouraging residents from spending time in-world. The lure of Google-like search revenues may be to great for them to resist; may make it too difficult for them to see the big picture: that with fewer people left in-world, there will be fewer people in-world adding to all the things that make made Second Life great, and fun. If they want to turn Second Life into a web-based virtual shopping experience, and try to compete with IM and social networking programs without actually getting the residents in-world, all that will happen is they will pick up some short-term residents that don’t really invest or contribute or add to the world, and lose the long-term ones who do. I returned my region to Linden Lab last week. I tried to sell it, but when the next monthly payment is due, and you can’t even sell it for the amount of that monthly payment if you do sell it, then the financially prudent action is to have them remove the region from the grid before the next payment is due. $295 a month. That’s a sizable chunk of someone’s real-life monthly rent. Or put another way, it’s a car lease payment, month after month. I’ve returned my region now; that’s like winning (for free) a brand new car. Linden Labs cut all the statistics that show declines from the economic stats reports. Well they left one in: user hours. 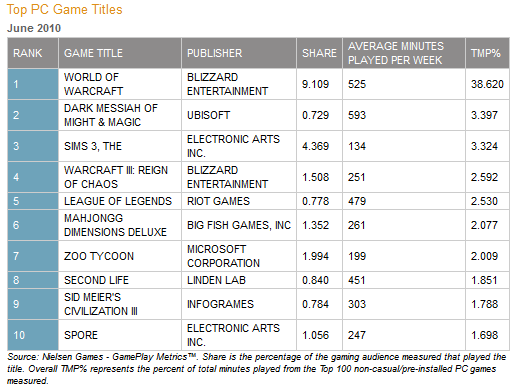 There, Linden Labs themselves report a 13.5% drop in user hours from 126 million to 109 million. Nelson Linden, who posted the results, blamed that on their new improved policies on bots. Frankly that isn’t believable; a policy change would show a more sudden drop, not a gradual decline over a full year. And I don’t really believe the hours anyway as real, human, user hours. It conflicts with the Nielsen report above that shows a 40% drop in minutes per week. And if I have to choose who to believe, Nelson or Nielsen, well Nielsen aren’t the ones changing their stats reporting each time, preventing any half-decent trend analysis. They call the economy “stable” — that’s a great euphemism for “flat”, which in the online gaming and social networking worlds means “dying”. You are either growing, and quickly, or you are dying and soon to be replaced by The Next Big Thing. Sorry Lindens, but “stable” means “pull up soon before you slam into the ground”. The one statistic I would have liked to have seen is how much land has been abandoned, either still existing but unowned land, or returned to Linden Lab and removed (like my region). In the past couple of months, I have returned 2 homesteads and a full region. That’s 196,608 sqm removed from the grid. And that’s just me, a modest land owner. A 4-year veteran of Second Life who has been promoting it pretty heavily for the first three years… until the last year, and now leads a disillusioned life in the Linden-free alternative of InWorldz. The scariest part of all this: I don’t feel like I’m losing something. I feel like I’m finally escaping the trap.